A Work-in-Progress Cyber-Exhibition of my collection of All Things Pinocchio... (Nope, nothing here is for sale). 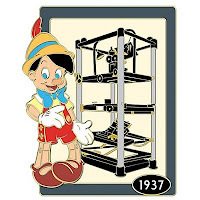 On this pin, Pinocchio stands beside the revolutionary multiplane camera used to give the illusion of depth to animated films and first used by Disney in 1937's The Old Mill and later on such classics as Pinocchio and Fantasia. 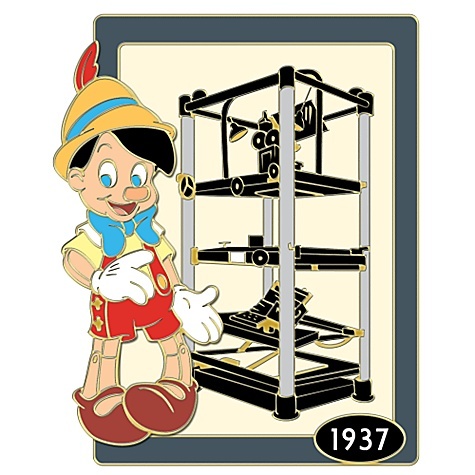 The first animated film I ever saw, as a real live boy, was Disney's Pinocchio. And I subsequently had a pretty decent career as a professional puppeteer and ventriloquist for most of my first forty years. PinocchioMuseum.org is a cyber Museum record of what I have... And in some cases a wish list of what I don't have... Or a record of just some related things of interest. This is a work in progress... And that's no lie!